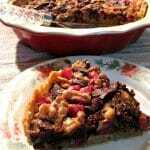 This festive Chocolate Walnut Cranberry Pie is both sweet and tart, and a great change from a typical pecan pie, making it a great addition to any holiday dessert table. 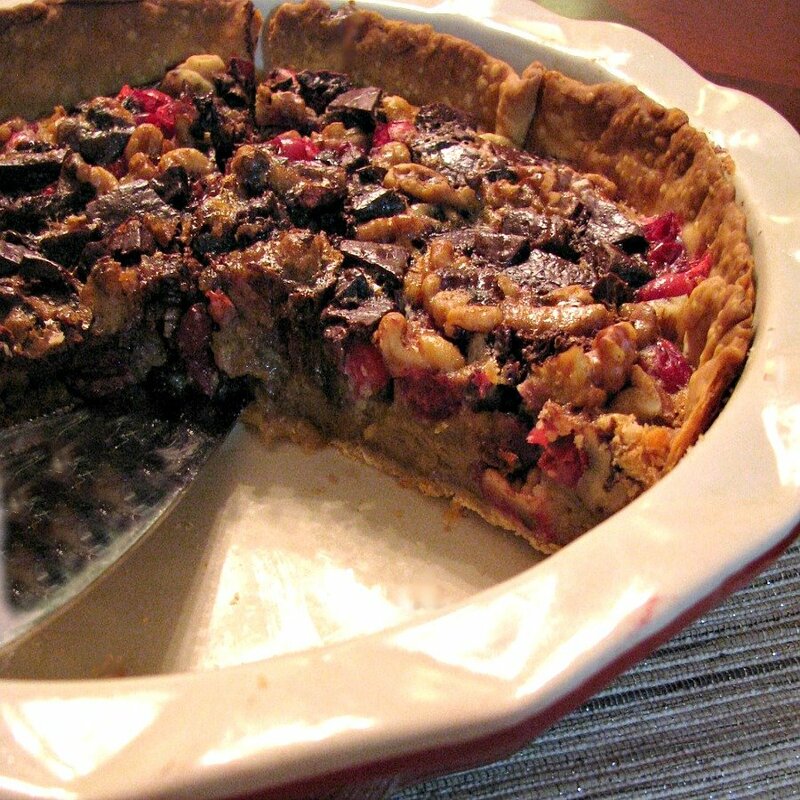 If you love pie (who doesn’t) you need this chocolate walnut cranberry pie in your life! That is, if you already like the chocolate, walnuts, and cranberries that’s in it. If you don’t, then you don’t need this pie, sorry. It’s a great change from pecan pie, and absolutely full of flavor. Both really sweet and really tart. I plan to freeze what we didn’t already eat for Christmas dessert, but it would be great to make for a party or to give to neighbors and friends. 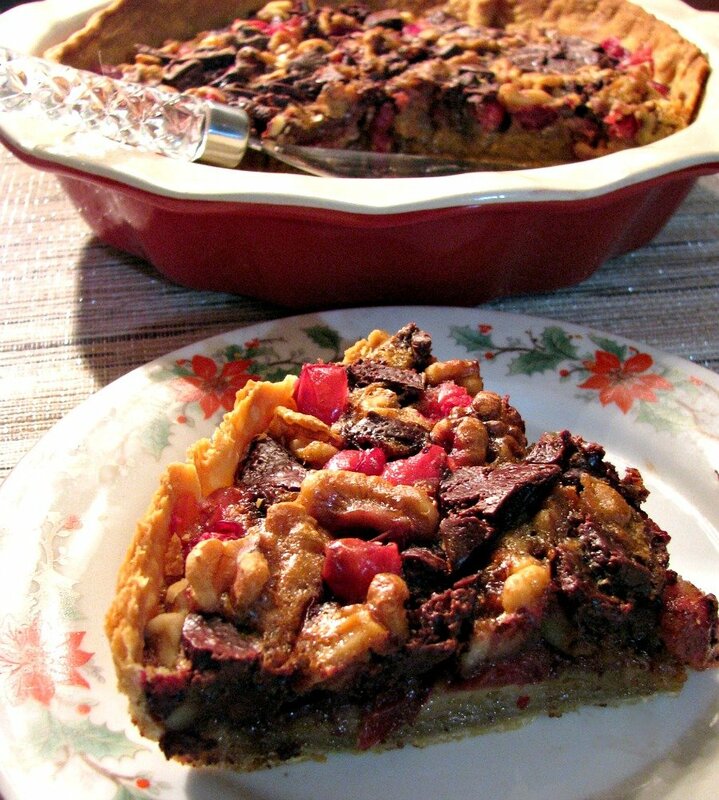 Check out all the great sweet treats shared by the rest of the #ChristmasWeek participants after the recipe for this amazing chocolate walnut cranberry pie, adapted from A Dash of Sanity Chocolate Pecan Cranberry Pie. Roll out pie crust and place evenly into a 9 inch pie pan. 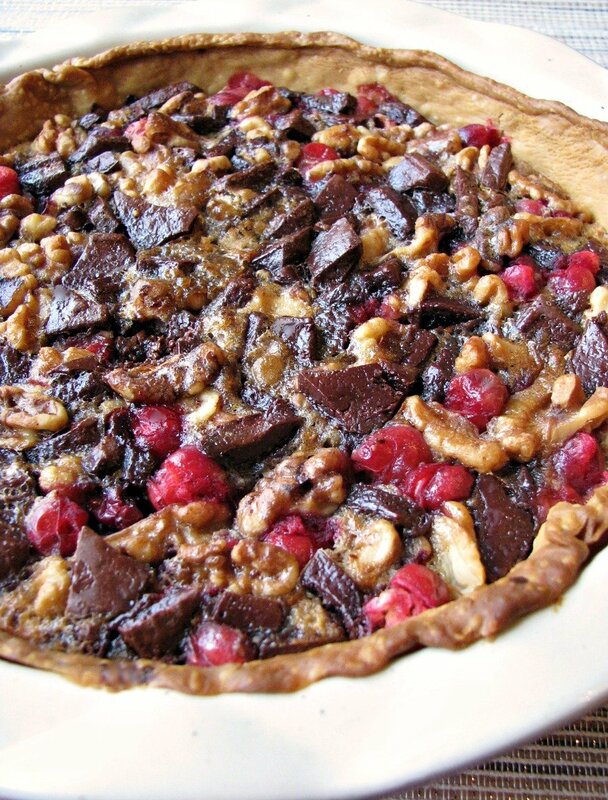 Pour the cranberries on top of the unbaked pie crust, followed by the walnuts and chopped chocolate. In a medium mixing bowl, beat the eggs, then add the brown sugar and beat until the sugar is dissolved (make sure to break up any lumps of sugar). Add the maple syrup and then slowly add the flour, beating while adding, until all the flour is incorporated. Pour the mixture over the cranberries, walnuts, and chocolate. Bake in the preheated oven for 15-20 minutes, then cover with cooking spray coated aluminum foil. Bake for 15-25 minutes more, or until the crust is golden brown and the filling is set in the center of the pie. Allow to cool completely on a raised wire rack before slicing, about 2 hours at room temperature. Adapted from A Dash of Sanity Chocolate Pecan Cranberry Pie. I may have had rum balls before, but I don’t think I’ve had coquito. Thanks for stopping by! Okay, first off, you know where I live so bring me cookies! Thank you! Secondly, I can make desserts, but savory just comes more natural to me. Thanks for saying it looks fantastic! I loves me some pie for every occasion. Cranberries and chocolate are so great together.